The spokesman for Gov. Dannel P. Malloy’s budget and policy office, Gian-Carl Casa of New Haven, will leave the administration later this month to head Connecticut’s largest coalition of private, nonprofit organizations. 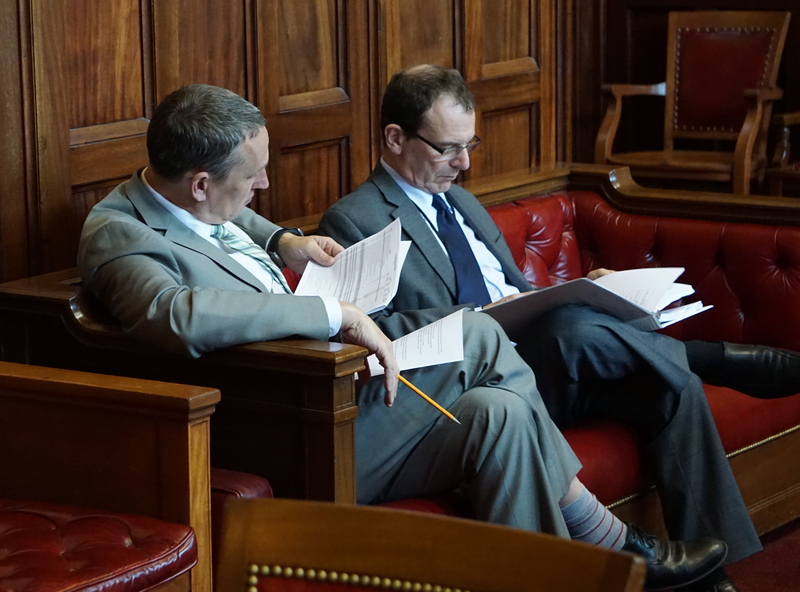 Gian-Carl Casa, right, the governor’s budget spokesman and Ben Barnes, the governor’s budget chief. Casa, 58, who has been undersecretary for legislative affairs with the Office of Policy and Management since the Malloy administration began in 2011, will become president and chief executive officer of the CT Community Nonprofit Alliance on July 28, the coalition’s Board of Directors announced. The alliance represents more than 550 community-based nonprofit organizations and associations, many of which contract with state agencies to provide social services and other state-sponsored programs. In his Malloy administration post, Casa has spent the past five-and-a-half years working on legislation related to state spending and revenue issues, coordinating financing for capital projects and serving as spokesman for OPM. “I am excited by the new opportunity and challenge, although I am sorry to leave Governor Malloy and Secretary Barnes and am proud to have worked with them,” Casa said. Before working for the governor, Casa had spent more than two decades at the Connecticut Conference of Municipalities — the chief lobbying agency for cities and towns. His last post there was director of public policy and advocacy. Casa, who could not be reached for comment Wednesday, has bachelor’s and master’s degrees in political science from Syracuse University.